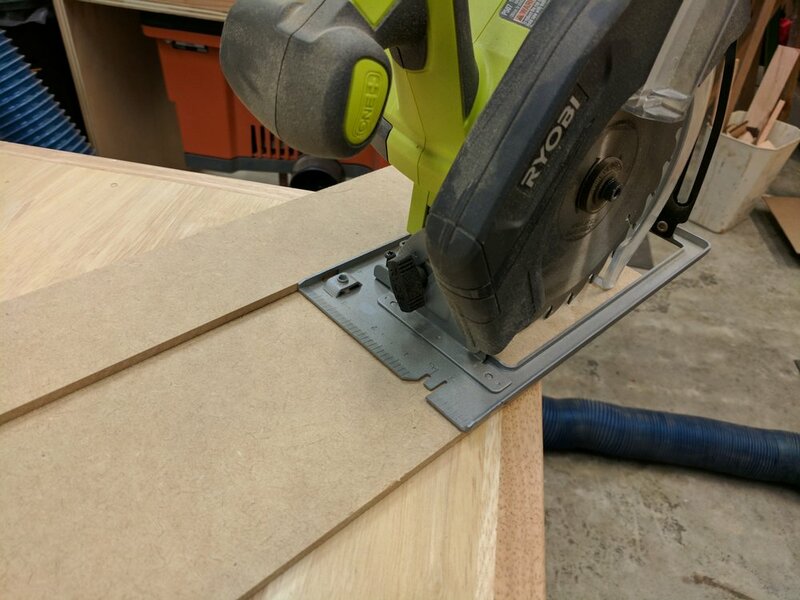 These are sometimes called Door Boards, but basically it's just a track to run your circular saw against to make perfectly straight cuts without the expense of purchasing a track saw. This is very easy to build and won't take much time at all, lets get started! Start by cutting the sheet down to size. Be sure to leave enough room for the entire base of the saw to sit on the board. These dimensions can be changed to fit the needs of your saw. This is for my Ryobi cordless circular saw. Glue and clamp the thinner fence to the edge of the wider board. Be sure to clean up any glue squeeze out. A cheap straw works great for getting the glue out of the corners. Allow a few hours for the glue to dry, take the clamps off and make your first cut with the saw. Be sure to keep the saw tight against the fence as this will give you a nice zero clearance fit and will allow you to place the board right on the line and make a straight cut. Now you can clamp it down and make your first perfectly straight hassle free cut with your circular saw!